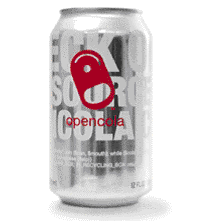 Like Open Source Software here comes a Open Source Cola where everyone can modify their recipe to achieve a better beverage. While Pepsi and Coca-Cola (and others) closely guard their secrets to making cola beverages, several organizations have released their own recipes. Below is the recipe for homemade "OpenCola," an open-source cola beverage that invites makers to create and modify their recipe to achieve a better beverage. It is licensed under the GNU General Public License.